Waiheke Rotary have the usual busy start to the year with their four signature events all well supported and very successful. The first, on the 17th January with 770 entries, was the annual Wharf to Wharf race from Orapiu, up many very steep hills to arrive 25 kms later at Matiatia http://wharf2wharf.co.nz/. All of the local Rotarians are Marshalls each year and guide the runners through intersections and by passes to arrive safely – if not exhausted -at the other end. Each year Rotarians are taken through the updated ideas of first aid and resuscitation if we witness a collapse or injury and the local doctors ride the course continually on their motor bikes ensuring they are all OK. The weather was perfect and the runners had a fantastic day with many prizes allocated. The second was the iconic Onetangi Beach Races on Sunday 22nd February which has being going for over a hundred years and run very successfully by Rotary for the past 17 years http://www.onetangibeachraces.co.nz/. It has evolved each year attracting more visitors as the word spreads and more exciting events happen. The first event was the world’s largest Sealegs race as Waiheke proudly boasts the most per head in the world with over 70 on the Island each costing at least $175,000. Then the usual tractor, kids in wheel barrows and horse racing plus tug of war, silent auction, storytelling, fashion in the field etc providing a fun exciting free day for all. The next event was Opera On The Gulf on Saturday 28th February held at the spectacular cliff top home of Tony and Sandra Pope in Cory Road overlooking the Hauraki Gulf http://www.waihekeartgallery.org.nz/whats-on/events/opera-on-the-gulf/ . This was an outdoor concert attended by over 200 opera lovers where they listened to an inspiring mixture of favourites performed by Helen Medlin, Patricia wright, Rodney McCann and Richard Greagor and the Aotea Youth Symphony Orchestra. In between the breaks the guests were served delicious canapés and award winning Waiheke wines. Part of the funds collected went to The Waiheke art gallery. 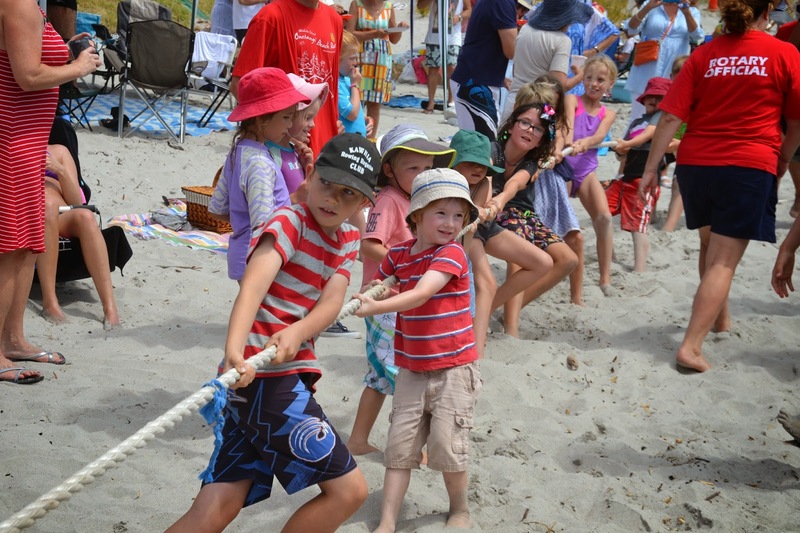 The last summer event was the King Of The Bay on Sunday 15th March http://www.rotarywaiheke.co.nz/photo-gallery/king-of-the-bay-2012. This was the day that Cyclone Pam decided to wreak havoc around the island with high winds starting around lunch time. However, with 60 entries there was still had a lot of fish to weigh and auction. This year, instead of the largest fish, to preserve the breeding stock it was decided to have a mystery weight which was 1.2kgs. Over 200 locals were in attendance and the proceeds of the event will be going to Living Without Violence. Takapuna North Rotary (Challenge Camp) $330.